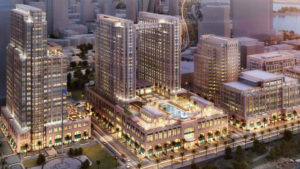 Construction will begin Saturday on the largest private real estate project in San Diego—a $1.5 billion redevelopment of 12 acres of Navy land on the downtown waterfront. 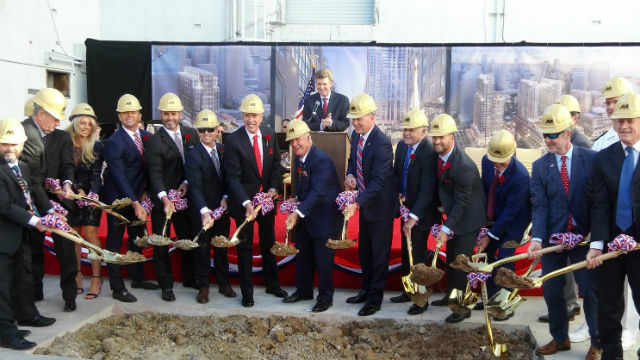 Manchester Financial Group held a ceremonial groundbreaking Friday for the Manchester Pacific Gateway, a complex of seven buildings — including regional headquarters for the Navy — that will open in three years. Developer Papa Doug Manchester said the project took 12 years to reach the start of construction, but will be more than worth the time invested for both the Navy and the city. “This represents what will end up being a $15 billion economic benefit to the San Diego region without a government subsidy,” he said, nothing that it will support thousands of jobs during construction and after opening. A rendering of the Manchester Pacific Gateway. The Navy headquarters is the tower at right. The project includes two hotels, 1.1 million square feet of office space, 391,000 square feet of restaurants and shops, 4.5 acres of public open space, and 2,400 underground parking spaces. The site is bounded by Broadway, Pacific Highway and Harbor Drive. The Navy exchanged the land for a new headquarters building, a 17-story, $174 million structure that replaces deteriorating 1920s-era buildings and parking lots.